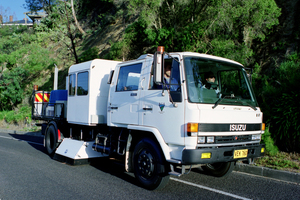 CSIRO's RoadCrack, developed in collaboration with the NSW Roads and Traffic Authority (RTA), is a mobile camera and image-processing tool that detects, classifies and reports on cracking in road pavement. RoadCrack is the first system in the world to achieve the RTA's standards for an automated, objective and accurate crack detection system. High-speed cameras are mounted under a vehicle to collect digital images of the pavement surface while the vehicle is moving at highway speeds. A special reflector system focuses light to illuminate tiny cracks. High-resolution images are collected for small sections of pavement and then consolidated into bigger images that cover half-metre intervals of the road surface.